The Fourways North Business Centre was established and opened in January 2013. Being one of the newest Business Centres built, this building plays host to some of the most innovative technology today. Being in the right business location is 50% of the solution. Having an office space provider that offers a number of the services and facilities that contribute to the productivity of your business is the other 50%. Fourways North Business Centre wears both hats and ensures that each tenant is completely satisfied with services and service delivery. Ideally located in the established Broadacres suburb, this Business Centre has a homely and hospitable look and feel. Chic lighting and décor complement the welcoming feel of this centre. Artwork, wallpaper and plant life was carefully selected to keep the centre looking refreshed and modern at all times. A sophisticated and attractive reception desk welcomes you as you enter this stylish building. Two waiting areas are decorated with an earthly feel, from brocade wallpapers to wooden coffee tables. Guests can enjoy a coffee at the café around the corner with an open-plan effect, leading into atriums. The Business Café serves a selection of appetising cuisine and will gladly assist with delivering your order to your office. With exclusive selections of Five Roses Teas and Lavazza coffee, you can enjoy refreshing beverages throughout your day. State-of-the-art technology is evident in this modern centre. Customised access control cards foreach individual is used, as well as digital logo walls at reception. Evoko screens within each boardroom, state if the specific room is available or occupied. 7 meeting rooms can be found at the Fourways North Business Centre and two of these rooms are floating meeting rooms. This innovative idea creates a perception of guests floating whilst in a meeting, as these rooms stand on the first floor overlooking the café area. 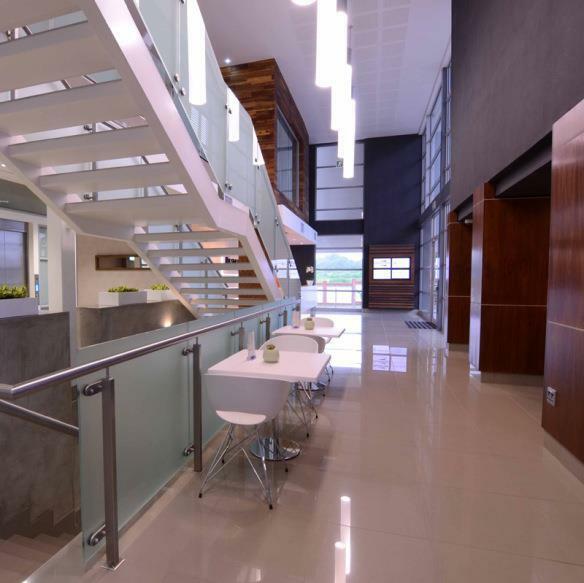 With Fourways North Business Centre being fully serviced, your business can enjoy focusing on productivity rather than tedious services such as receptionists and IT support. Our on-site technical team will assist with any IT maintenance that you may need. Simply call our reception area, and your call will be logged and attended to within 45 minutes. This elite and newly developed Business Centre offers convenience, comfort and the perfect complement to the finest company image. Ideally located in the established Broadacres suburb, this Business Centre has a homely and hospitable look and feel. A sophisticated and attractive reception desk welcomes you as you enter this stylish building. The Business Café serves a selection of appetising cuisine. State-of-the-art technology is evident in this modern centre. 7 meeting rooms can be found at the Fourways North Business Centre and two of these rooms are floating meeting rooms. Chic lighting and décor complement the welcoming feel of this centre.